Outer Aisle owners, Eric and Christine Taylor, farmers and chefs, have been pioneers of the local food movement since 1993. Their kitchen garden, located in Douglas Flat just a mile from the Outer Aisle venue, is the inspiration for their culinary passion. Christine hails from New Zealand, where her Lebanese ancestral roots were celebrated with traditional foods and social gatherings. She met her husband Eric in Bear Valley on a work exchange. 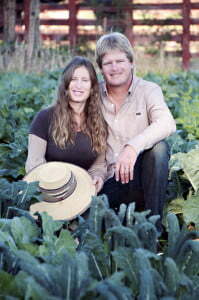 Eric’s family has been farming in Vallecito since the pioneer days of the mid 1850s. On family trips to Europe at a young age Eric was introduced to the culinary traditions of Italy and France and was inspired by cuisine based on seasonality. On one acre they produce over 150 varietals ranging from heirloom tomatoes to broccoli and carrots. Their 25 years of dedication to the growing of food has culminated into the culinary arts. Soil to service is a term they coined to describe a deeper farm to fork philosphy that is rooted literally in the soil and ultimately delivered with gratitude in service.